One has to love creatures so exotic and lavishly endowed. The roses of summer are glorious creatures in their time of blooming, be the flowering an interval lasting a few weeks or one lasting all summer long. All artful curves and lush fragrance, velvety petals and fringed golden hearts, the blooms are lavishly dappled with dew at dawn, and they're a rare treat for these old eyes as early sunlight moves across them. If we are fortunate, there will be roses blooming in our garden until late autumn, and we three hold the thought close. 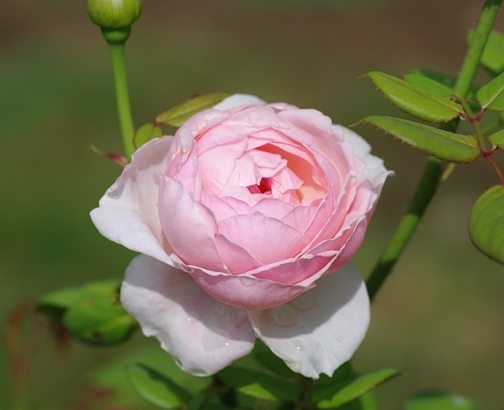 The word rose hails from the Old English rose, thence from the Latin rosa and the Greek rhoda. Predating these are the Aeolic wrodon and the Persian vrda-, and at the beginning of it all, the Proto-Indo-European (PIE) form wrdho- meaning "thorn or bramble". Most of our roses have thorns to reckon with, and none more so than this morning's offering. We can see this exquisite bloom from our bedroom windows, and watching it, we find ourselves falling in love with roses all over again. They are particularly lovely as they mature, graceful as they fade and wither and dwindle, their petals falling away and fluttering to the earth like confetti. There's a bittersweet and poignant aspect to such thoughts in July, and I remember feeling the same way last year around this time. Here we are again in the second half of a calendar year and pottering down the luscious golden slope to autumn and beyond. Bumbles love roses, and they spend their sunlight hours flying from one bloom to another. My pleasure in the season and a gentle melancholy seem to be all wrapped up together in falling rose petals and blissed out bumblebees. Call it wabi sabi and treasure the feelings—they are elemental expressions of wonder, rootedness and connection, the suchness of all things. How sweet it is, thorns and all. My roses were outstanding this year with all the rain. Then they look peaked through our hot summers, but hopefully will rise again in the fall.